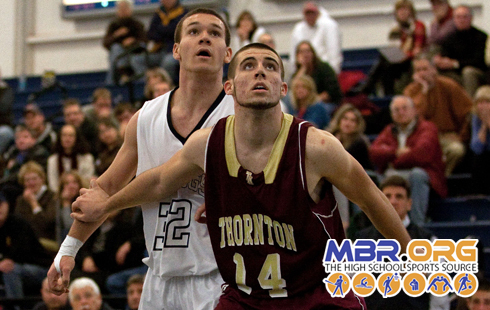 Thornton Academy used a full-court press and some good bounces of the ball to knock off Portland 57-54 at the Portland Expo on Friday night. James Ek led the Trojans with 19 points, Justin Pollard added 12 points, and Andrew Shaw had 11 points in the win. The Trojans overcame a 6 point deficit at halftime aginst the young Bulldogs squad, who were led by Mike Herrick's 14 points. Pete Donato, who had a nice block on Shaw late in the first half, chipped in with 9 points. To listen to the archive of this game and hear the post-game interview with Andrew Shaw, head on over to MBR Radio.